Wash the kale (or spinach) and cut out the large central stems. Chop very finely and steam briefly. 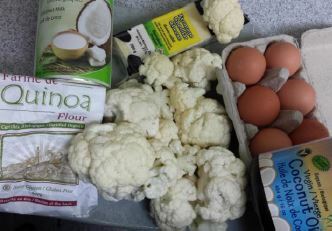 Wash the cauliflower and/or broccoli and cut them into small florets. Steam them without overcooking, and then remove promptly from the steamer. After it cools down, squeeze well all the excess liquid, a handful at a time, over the sink. Chop into smaller pieces, especially the stems. Warm up 3 tablespoons of the oil in a pan on low heat. Stir and dissolve 3 tablespoons of arrowroot powder into 1 cup of cold milk. Pour the milk mixture to the oil pan and add the seasonings. Stir continually for about 10 minutes. 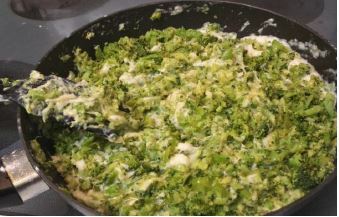 As it starts to thicken, stir in the grated cheese as well as the steamed and chopped veggies. Pull it aside, and let it cool down. Stir 3 tablespoons of flour in the egg yolks. After the white sauce cools off, add the egg yolks. 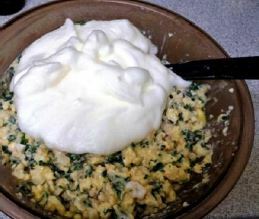 Beat the egg whites until stiff peaks form; then fold into the rest of the composition. Note: This step should not be done in advance because the whites must be freshly beaten when added, and the rest of the mixture should be almost cold. Use the last tablespoon of butter or oil to grease a shallow baking dish, and then dust it with flour. Pour the soufflé mixture in the dish and bake it in the preheated oven for about 90 minutes. Cut it into small portions, and store it covered in the refrigerator. but it is best enjoyed cold as an appetizer or as a healthy savoury snack.